Conducted between 9-14 September 1914, the First Battle of the Masurian Lakes (of two, the second in February 1915) was the second victory of the war by the Germans over the Russian army, the first occurring at Tannenberg in late August. Having successfully dealt with the Russian Second Army, commanded by Samsonov, at Tannenberg, Paul von Hindenburg's Eighth Army - comprising 21 divisions, 18 of infantry, 3 of cavalry - turned their attention to the Russian First Army, commanded by Rennenkampf. These two armies had been deployed as two arms of a pincer movement intended to snap up Hindenburg's forces in East Prussia. With one arm of the pincer broken, Hindenburg determined to neutralise the other in short order. Hindenburg aimed to encircle Rennenkampf by breaking through a weak flank of the latter's southern corps who had belatedly moved south to support the Second Army at Tannenberg and who had become somewhat separated from the main body in the west (who had remained passive during the earlier battle). Rennenkampf's army was presently moving through the Insterburg Gap between Konigsberg and the Masurian Lakes. 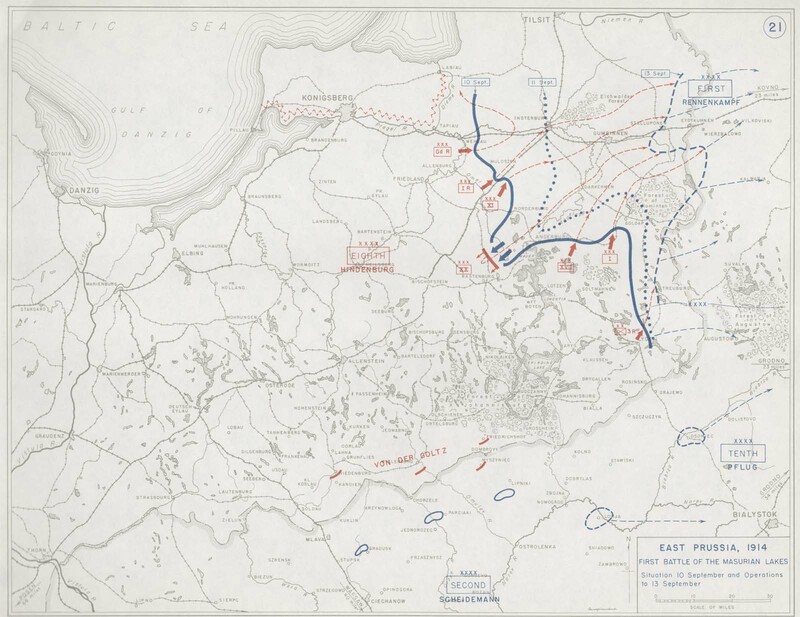 However, upon receiving news of the Second Army's defeat, Rennenkampf ordered his forces to retreat to a firmer position extending from the Baltic south-east to Angerburg. 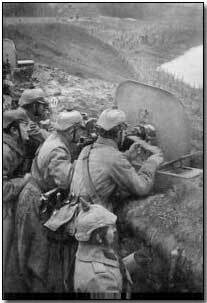 A preliminary German attack began on 7 September, lasting two days, launched from either side of the southern lakes, its aim being to push the Russians up towards the coast. 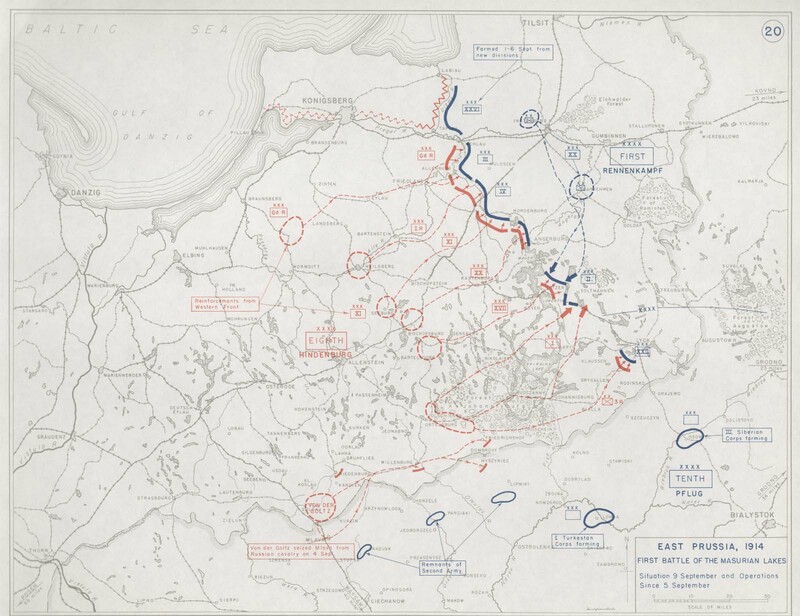 Heavily outnumbered 3-to-1, the Russian forces dispersed, and the German advance continued northwards in pursuit of the main body of the Russian army. Rennenkampf, who feared being outflanked, consequently authorised a further orderly withdrawal on 9 September, simultaneously ordering a counter-strike at the Germans by two divisions so as to hold up the German advance whilst his men pulled back. In this Rennenkampf was successful, although with the retreat of his forces East Prussia had been cleared of all Russian troops by 13 September. Furthermore, Russian casualties during the battle were high: 125,000 compared to the German figure of at most 40,000, although the Germans could ill-afford such high losses in the east. Yakov Zhilinski, the army group commander responsible for the Russian plan of invasion, was dismissed as a consequence of the Russian army's perceived poor performance. The action had resulted in two defeats of the Russian army, and largely removed any threat to German forces stationed in East Prussia, although a Russian counter-attack from 25-28 September (the Battle of the Niemen) forced a German retreat back to the border and resulted in the Russian army retaking much of the ground lost in the First Masurian battle. As a consequence of Tannenberg and the Masurian Lakes - although the former battle was a much clearer cut victory than the second - Hindenburg was hailed as a hero in Germany, subsequently succeeding Falkenhayn as Chief of the German Staff in late summer 1916. Despite Hindenburg's fame at home, his Chief of Staff, Erich Ludendorff, was the chief architect of these, and future, Hindenburg victories. 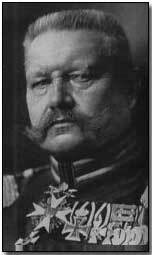 He followed Hindenburg to Berlin as his quartermaster general upon Hindenburg's promotion to Army Chief of Staff. Click here and here to view maps charting the course of the battle.